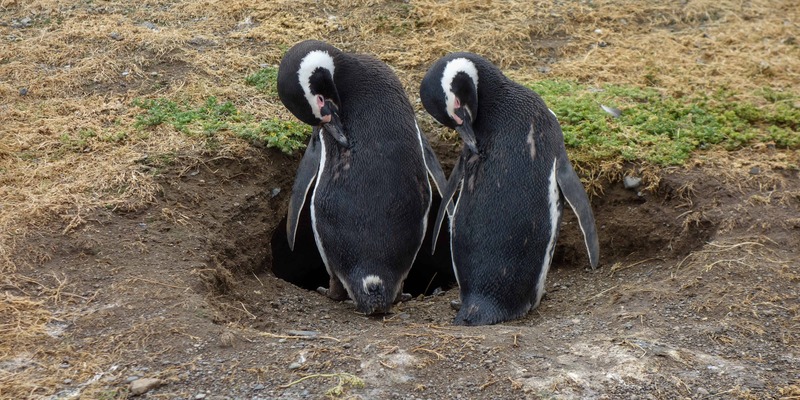 The penguin colony on Magdalena Island is one of the main reasons to visit Punta Arenas. Boat trips leave from the Tres Puentes harbour and have to be booked through agencies in town. The cheapest operator is, as of January 2018, Comapa. They will take you to the island in the afternoon, which you reach after a trip of two hours. You have an hour on the island to follow the path and take a walk. The colony on Isla Magdalena is the biggest penguin colony I have ever seen. They were everywhere, standing watch in front of their burrows, grooming each other and looking after their offspring. By the time we went, in January, the babies were already big enough to start losing their fluffy plumage. I looked it up online but could not find an exact number of how many penguins live on Isla Magdalena. It might be around a hundred thousand, more or less, that come here every year to nest. Once the babies are old enough to continue on their own, the penguins migrate north for four thousand kilometers, until they reach Brazil’s southern coast. 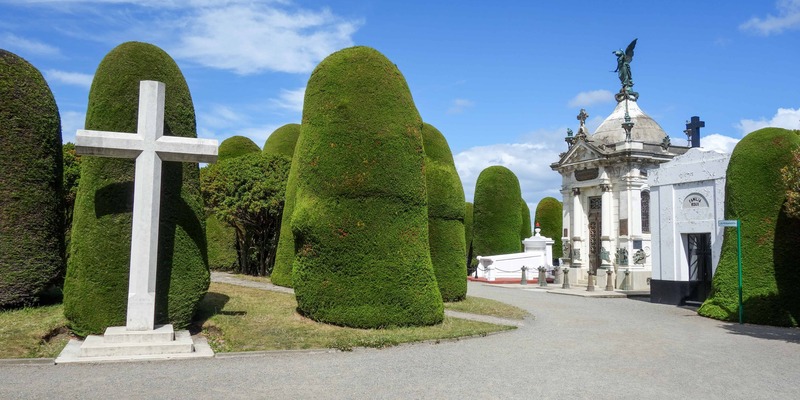 It might sound weird, but Punta Arenas’ second attraction is the municipal graveyard. If you have been to Buenos Aires, you will see similarities to the cementery in Recoleta, even though most graves here are smaller. The beautiful white graves tell a tragic story of Punta Arenas’ inhabitants dying far too young. Looking around, you can find a monument dedicated to young men lost at sea, or a small section reserved for immigrants insured by a German health insurance. You can also discover the grave of Sara Braun, a mausoleum locked behind a fence in a corner of the graveyard. If you are wondering who she was, she must have been one of the richest and most important personalities back in the founding days of Punta Arenas. 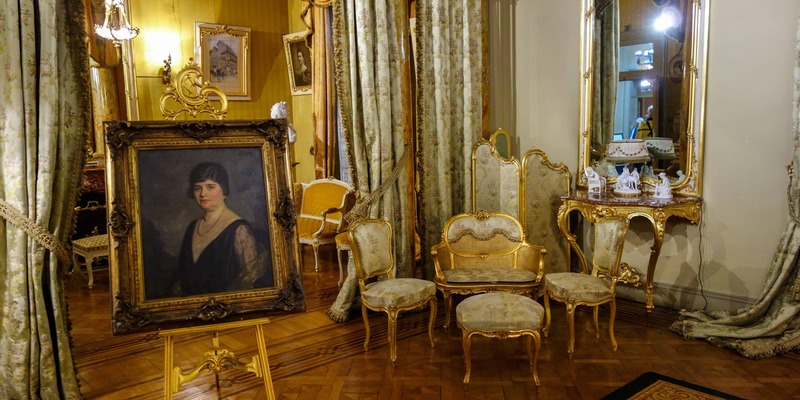 You can also visit the Palacio in which she used to live. The regional museum is well worth visiting. Located in a palace that once belonged to the Braun family, it houses varies exhibitions. First, you can admire a recreation of its insides, complete with its luxurious furnishings. Further onwards, the rooms are dedicated to the history of the region and in the basement, you have ever-changing temporary exhibitions (plus a few rooms that were once inhabited by servants). 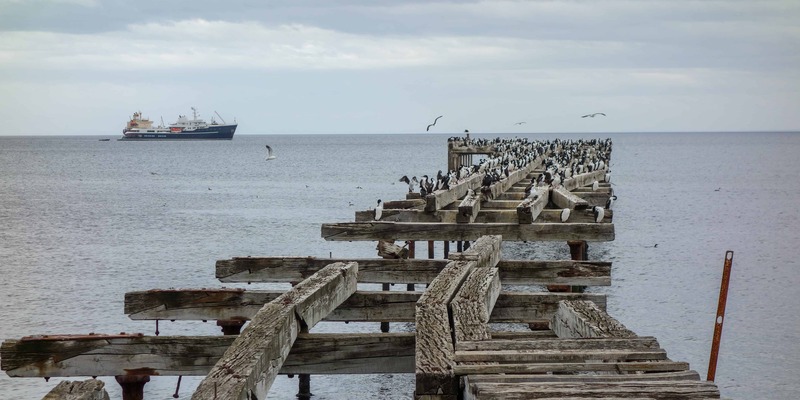 One of the things you definitely should do while visiting Punta Arenas is taking a walk along the waterfront. Here, you can see the old docks and train tracks that were once used to load ships. They have since then fallen into disrepair and are now the home of hundreds of comorans. With their black and white feathers and their upright position, these birds almost look like penguins. But unlike penguins, they can fly, which allows them to pose for pictures on top of the old piers. The Palacio Sara Braun is located just next to the main square and can be visited for a small fee. We unfortunately missed it, since we did not read the sign with the opening hours correctly (hint: it is closed on Monday afternoon). But judging from all the reviews online, it is well worth going inside. Even if you cannot go into the palace, this part of the city is good for taking a walk. You will find most of the historic houses near the main square. If you speak Spanish, signs will teach you about their history. So there you have it, five things to keep you occupied in Punta Arenas. I hope I could help you out and I would love to get some feedback. How long did you stay here? What did you do?